How else can I measure humidity? There are some other ways of measuring humidity. Here are a couple more. Measuring humidity can be important in many places. Some museums have a machine to record the humidity continuously on a sheet of paper. They do not want their precious old exhibits to get too dry or too damp. When plants need to be grown in special conditions the humidity may need to be monitored. When you have finished reading this page you may wish to return to the Humidity Page or the Collecting Data page. This device contains a dry bulb and a wet bulb thermometer. The reservoir has to be kept topped up with water. The wet and dry temperatures can be taken fairly quickly. This set of thermometers is useful for taking readings out on field trips. It has a special case to make it easy to carry. 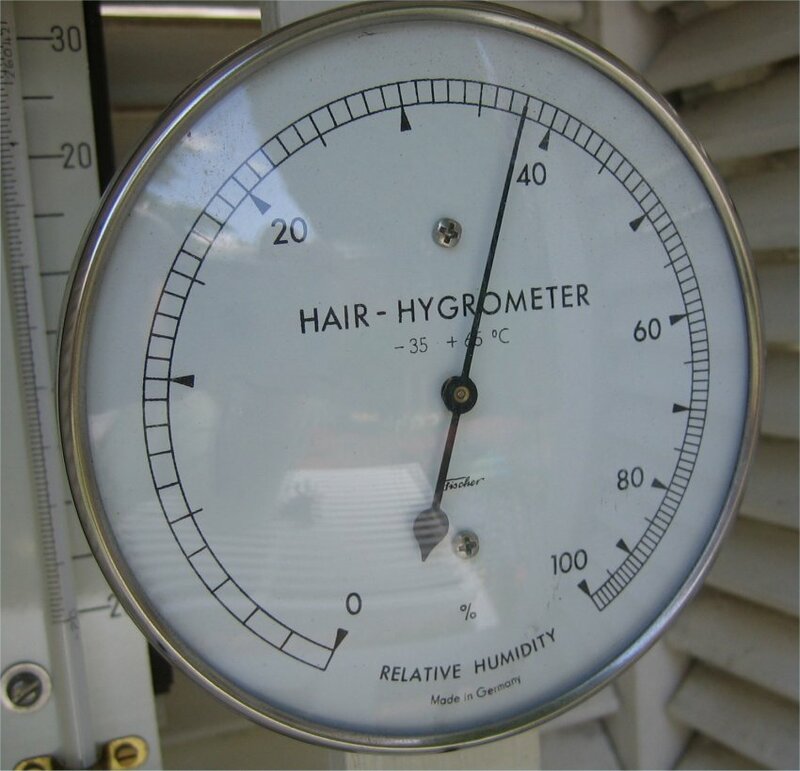 To take a reading the hygrometer is spun around in the air. Do this for 15 to 20 seconds. The thermometers are then both read, reading the wet bulb thermometer first. It may be a good idea to repeat the process and work out an average. The calculation is then made to work out the humidity of the air. The wet and dry thermometers are two similar thermometers which are mounted on a plate together. The wet thermometer is connected to the water reservoir so that it can be kept wet. The bottle is only kept half way full in the winter as water expands when it freezes. This could damage the bottle. Sometimes it can prove difficult to obtain a wick that fits a thermometer. One way of getting round this is to knit one. 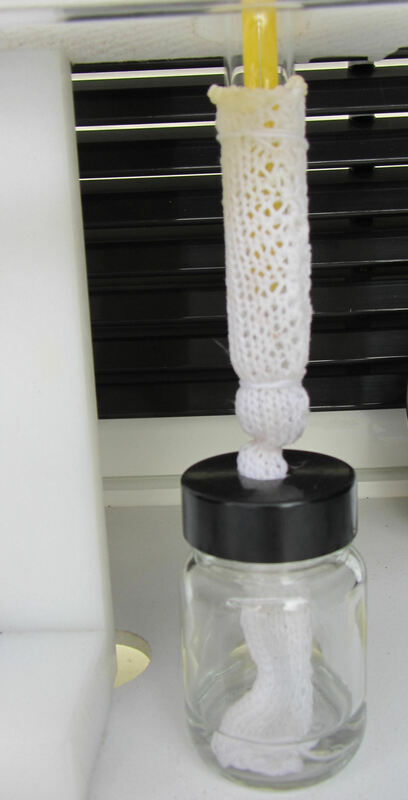 You will need to use 100 percent cotton crochet thread, which is quite thin. 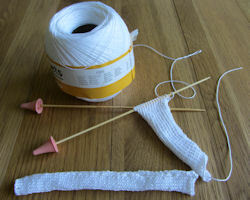 In this case size 2.5 knitting needles were used. Cast on 15 stitches and knit 15cm in stocking stitch. Cast off, then sew up the long side to make a tube. This forms the wick. Wash the wick before using it to remove any finish on the thread and make it more absorbent. This has proved very effective in keeping the wet bulb thermometer wet. When the wick becomes green through use it is possible to wash it and use it again. To see the knitted wick in use click here. You can see how it is tied round in three places. 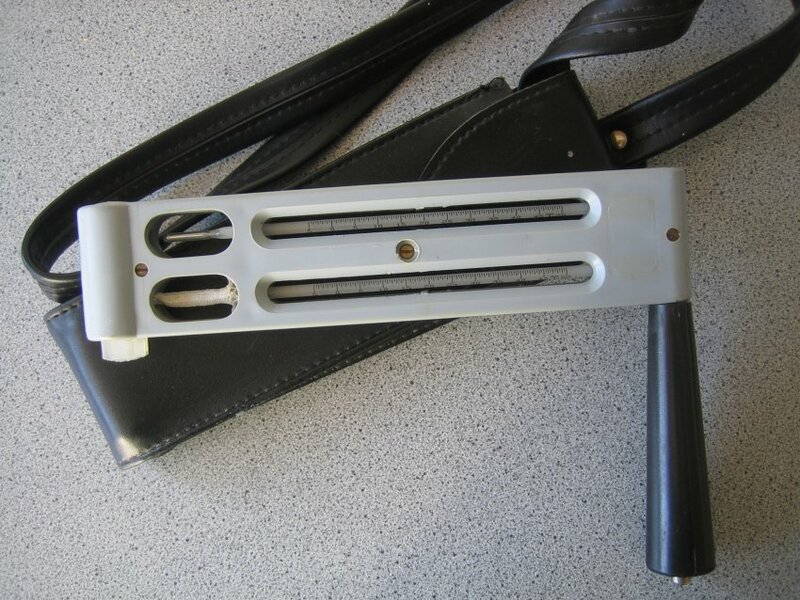 A real hair is used in this instrument. The human hair contracts (get smaller) or expands (gets bigger) depending on how much moisture is in the air. This device gives a reading by moving a pointer round a dial. Dials can be tricky to read. Treat them like a number line, count on or back from a marked number. Instruments for measuring the weather have been made for many years. This wet and dry bulb thermometer is quite old. It is at the University of Melbourne Physics Museum.